Cast your mind back to IFA and you might just recall the appearance of a dual-screen mash-up device with no proper branding or launch date. 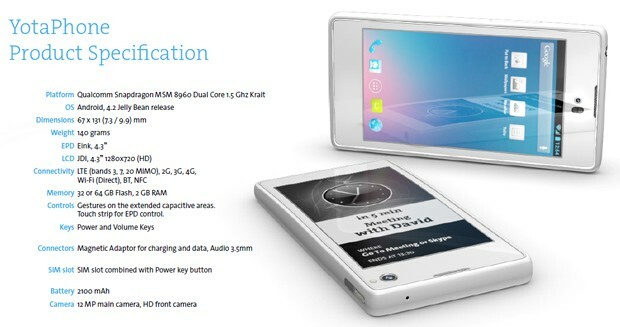 Well, it so happens we've been in touch with the mystery phone's maker, Yota Devices -- a spin-off from the more established Russian telecoms company of the same name -- and we're assured that this is much more than a whimsical concept. The Android-based handset has now reached fully working prototype stage and bears a Gorilla Glass 4.3-inch 720 x 1,280 LCD display on the front, a 200dpi E Ink rear display of the same size and toughness, and a dual-core 1.5GHz Snapdragon S4 processor with 2GB of RAM and at least 32GB of non-expandable storage. There's even LTE, a 12-megapixel rear camera and a 720p front-facer to round things off, all housed in a 140 gram body that is less than 10mm thick. If things go to plan, the YotaPhone should arrive on Russian networks in Q3 of next year for an untold sum of money, and Yota says it's "in talks" with certain US and European carriers too. Read on for more. Much like the Popslate case for the iPhone 5, the E Ink panel will be fed with information via an open API, which will allow apps to throw data -- books, playlists, appointments etc. -- to the secondary panel whenever it makes sense. At the same time, Yota's own pre-installed software will pull notifications from the OS and allow them to stay up on the rear display for as long as they're needed, while placing almost no added burden on the 2,100mAh battery. By divvying up labor this way, the company says it can boost battery life by at least 50 percent, while also improving readability in direct sunlight and allowing the time, messages, and other notifications to always be visible at a glance. We still have a bunch of questions about the device -- not least about build quality, and how the rear display works given that it's only partially touch sensitive (courtesy of a capacitive layer on the lower portion of the screen), and why there's no direct mirroring between the displays to allow the use of apps regardless of customized software. There are also big risks involved when any smaller player tries to challenge hardware giants based on one particular selling point -- although there are quite a few examples of that succeeding, especially in emerging markets. So far, Yota has been pretty open about how it sees the device developing between now and launch day, and it's promised us some hands-on time with the prototype very soon. based in Moscow, Russia. 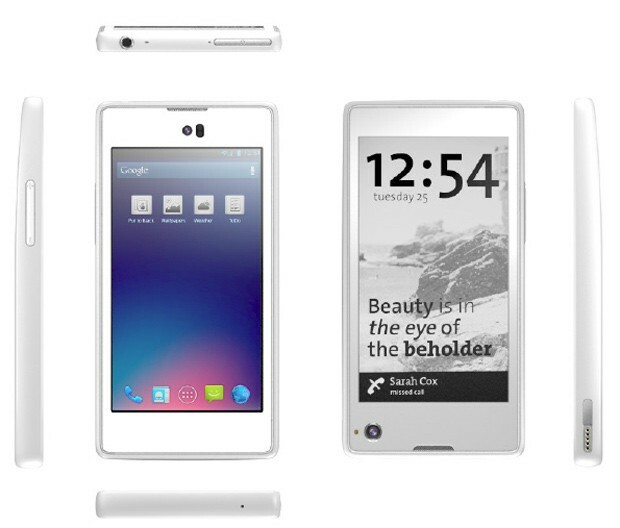 The company is now developing a new dual screen smartphone with an electronic paper display on the second screen. The phone will be available for sale in Russia in Q3 2013 and the rest of the world by Q4 2013.
investment group that was focused in the IT and telecom sector. The Yota name has been kept to reflect the excellent brand recognition of the Yota Group and to emphasize that Yota Devices is a consumer-friendly, hardware and software innovator. Yota Devices believes in a business philosophy strongly focused on innovation around the user experience. Yota Devices has a proven record in enhancing and modifying existing products to optimize customer interaction with their devices. routers and dongles. The company has 6% of the global LTE devices market. why it is obsessed with specs - bigger screens, more megapixels, lighter weight - rather than improving the user experience. product could be the engine for growing a sustainable business that continuously reinvests into new innovations and puts technology to work for users. phone will be available for sale in Russia in Q3 2013 and internationally soon after that. Yota Devices is an experienced developer and provider of fast, reliable and elegantly designed modems, routers and dongles. The first 4G WiMAX products were introduced to the market in 2008. Since then, more than 10 devices have been developed. The latest is Amber and Ruby, the latest generation of multimode (GSM/UMTS/LTE) dongle and portable router and advanced LTE-only multiband dongle. LTE-only FDD multiband dongle. It was commercially launched on December 2011 in Novosibirsk, Russia, after successful trials earlier that year in Kazan. Today, more than 1 million units have been sold primarily in Russia and Belarus. When introduced, it was the smallest, fastest time to Internet (only 5 seconds after plug in) LTE dongle on the market. It has more than 5 patented features. 9.9mm thickness, seamless over-the-air software update and driver-less operation. LTE/UMTS/GSM portable router simultaneously supporting FDD Bands 1/3/7/20 and TDD 38. Featuring electronic paper display, absolutely unique battery lifetime (up to 60 hours active) and patented USB hinge design.